I’m pumped to be a part of the Bundt Bakers group and this is my first recipe with them! 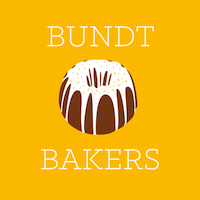 Bundt Bakers is a group of bakers who get together once a month and bake around a central theme or ingredient. July’s theme is fruits and nuts, hosted by Shilpi from Simply Veggies. There are over 20 recipes for fruity, nutty Bundt cakes this month. Yum. For this event, I decided to use the luscious summer cherries that are in peak season in much of the U.S. right now. You know, those fresh, juicy cherries that burst in your mouth and stain all of your fingers when you pit them. I know pitting cherries can be a pain, especially when the juice squirts out all over the counter, I mean cutting board. But, you get the reward of sneaking a few while you pit them, and stained fingers show everyone how much you love them for pitting fresh cherries just for the cake. Bonus points. After I settled on cherries for the cake, almonds were the first nut to come to mind as a complement. Then, as I was munching on a bag of pistachios and raving to my mom about how pistachios could be my favorite nut, I decided to add pistachios into my little creation instead. Of course, once I had my heart set on pistachios, I discovered that the local grocery store by mom’s place doesn’t carry shelled and unsalted pistachios. Out of the shell and salted? Check. Unsalted and in the shell? Check. Unsalted and out of the shell? Sorry amiga, looks like you’ll be shelling those pistachios yourself– right after you pit all those cherries. Sounds like the perfect excuse for an old episode of Desperate Housewives! Cooking and baking are a labor of love, right? Cherry pitting and pistachio shelling are just part of the process. It always seems to happen to me; an easy recipe turns a bit more complicated on my hunt for perfect ingredients. Does that ever happen to you? I remember a time when I went all around Arlington, VA and Washington, DC on the hunt for lavender for a lemon tart that didn’t really call for lavender, but I was committed to making it a lavender lemon tart. But, I digress. After the cherries were pitted and the pistachios shelled, putting the rest of the cake together was a breeze. If you want to make life easier, substitute the fresh cherries with a can of whole cherries, drained. And of course, more power to you if you find shelled, unsalted pistachios at your neighborhood grocer. Baking is fun, and it doesn’t need to be tedious! Then again, if you are looking to show your love with cherry stained fingertips, this cake is a great way to do so. Cherries and pistachios give this Bundt cake a tasty texture contrast and beautiful colors! Pre-heat the oven to 350F or 175C. Lightly butter the Bundt pan with butter and coat with flour, tapping out the excess or alternatively, use a baking spray to coat the pan. In a medium bowl, whisk together flour, salt, baking powder, baking soda, and cinnamon, then set aside. In a large bowl, cream the butter and sugar until light and fluff, about 4 minutes with an electric mixer. Add the eggs, one at a time, beating in well after each addition. Next add ⅓ of the dry ingredients, with the mixer on low. Then add half of the yogurt, continuing on low speed. Now, add the next ⅓ of the dry ingredients, continuing with the mixer on low, then the remaining yogurt, and finally the last of the dry ingredients. Remember to scrape the sides of the bowl as needed. Keeping the pistachios and the cherries in two separate bowls, sprinkle a tablespoon of flour on each and coat the cherries and nuts with a little flour, letting any excess flour fall to the bottom. Coating the cherries and nuts will help them from sinking to the bottom of the batter. Now, carefully fold the cherries and pistachios into the batter, taking care not to over mix, so you can preserve the shape of cherries. Pour the batter into the prepared Bundt pan and make for 40-50 minutes, or until the cake tester comes out clean. Let the cake rest for 10 minutes, then turn onto a cooling rack. Once cooled, drizzle the cake with honey, and additional cherries and pistachios if desired. Enjoy! Don’t forget to check out all of the other great Bundt cakes for this month, I mean, the fruits and nuts make these cakes healthy, right? Wow what a combination! one of my favorite fruits and one of my favorite nuts! I feel your pain though with all that shelling and pitting but this cake looks well worth it! Love all the flavors here. I bet it was wonderful! That is a cake made with LOVE. Your bundt cake looks amazing and I want to taste some of it soooon. Do you ship? LOL Welcome to Bundt bakers. I am glad to have found your blog. Oh how I wish there weren’t nut allergies in this house. There’s just no way I could eat this cake all by myself…I could try though!!! Cherry-pistachio looks like a great combo. You are quite industrious to have put so much effort into preparing your fruit and nuts. Very nicely put together! Welcome to the club. The problem with me pitting cherries and shelling pistachios is that more of them end up in my belly than in the bowl LOL. I absolutely love the colors in this cake! I never would have though pistachio. So great. Love this bundt pan! One of my favorites 🙂 Love the use of pistachios too! Wow, what a beauty…. Thanks for participating..